Welcome to out gallery of beautiful pictures of swimming pools. A swimming pool can be the focal point or the finishing touch to your backyard landscape. It will provide you and your guests with a touch of the soothing and calming properties of water – whether you are in it or lounging around it. 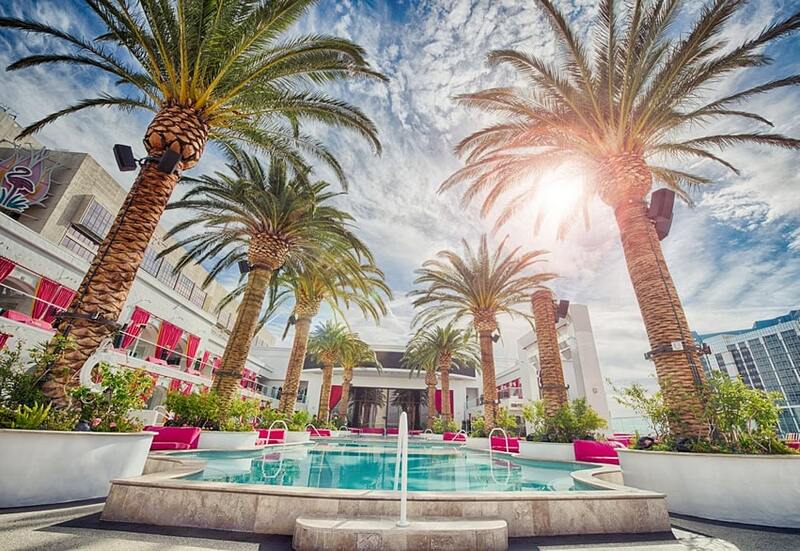 Here are some of our favorite swimming pool pictures we hope you’ll love. In the image above the turquoise blue waters of the overflow pool offer a smooth surface from which bright sunlight and blue skies can reflect back over the landscape for a calm and cooling effect. The clean curved lines of the white slate coping match the crisp lines of this modern home. Pools with Connected Spas – This type of pool offers an invigorating place to cool down on a hot day, or a relaxing place to enjoy the therapeutic benefits of a spa. A hot tub can be connected to the pool anywhere along its edge, surrounded by the pool, or elevated to become a water feature design. Infinity Pools – The infinity pool makes an impressive site when it overlooks amazing scenery such as a mountain, lake, or ocean. 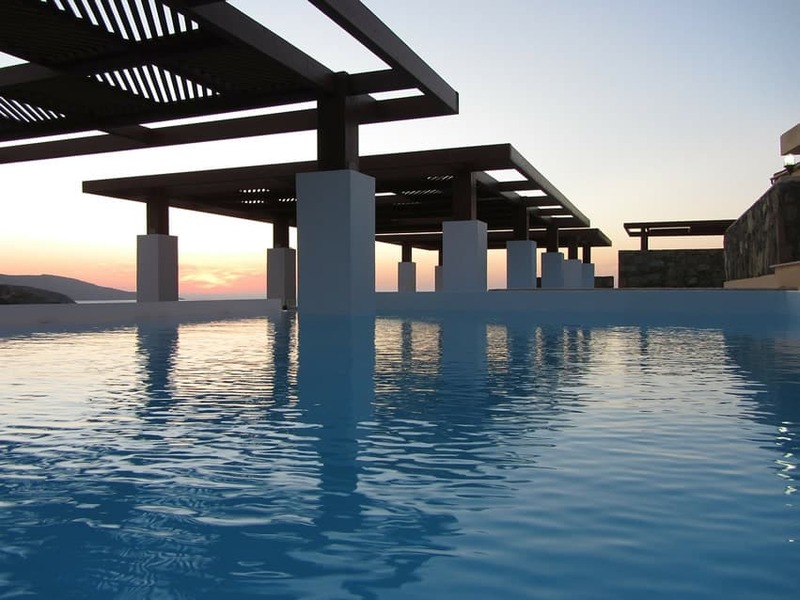 An infinity pool is also known as a vanishing edge, disappearing edge, negative edge, flooded edge, or just edge pool. Top designers often custom craft these types of pools to closely match the surrounding landscapes to create the perfect backyard retreat. Lap Pools – These long, narrow and rectangular style pools are ideal for fitness swimming and exercise. A lap pool can be just about any size, however they are frequently between 50 to 60 feet long with multiple swim lanes. Luxury lap pools are often used by athletes but can also be designed to include water features and impressive backdrops. Endless Pools – Also known as swim spas, this type can best be described as a swimming treadmill. Those confined to a small backyard or space can install an endless pool for its therapeutic benefits. The pool is powered with water jets to create swimming resistance for the swimmer. Often they will be equipped with a heating unit to become a pool/spa hybrid. Splash Pools – Also known as play pools, they offer a shallow area for relaxation and recreation. These are perfect for families with small children, or for reclining in shallow water in a lounge chair. Many designs offer tanning shelves or sunshelves where one can get a suntan while relaxing on a shallow ledge. These types also feature sunken seating, fire-pits, and intricate designs that make the pool visually stunning. Perimeter Overflow Pools – This type has water with the appearance of a flat sheet of glass contained without walls and is used in many modern pool designs. As the water overflows its edges it is recirculated back in to the pool and is similar to an infinity design. There are two main types of perimeter overflow pools – raised and deck level. 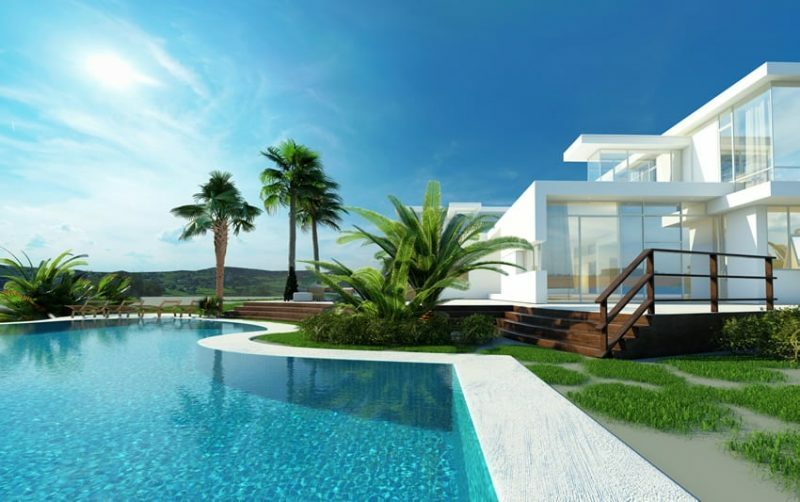 You’ll also find pools with perimeter-overflow spas which is a popular style for contemporary homes. 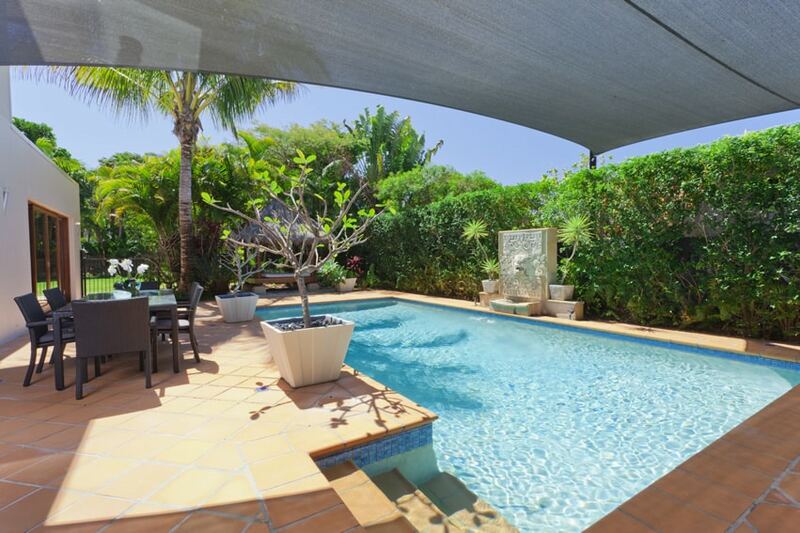 Beach Entry Pools – Your backyard tropical oasis isn’t complete until you include a beach entry or lagoon style pool. Some of the top features of this design is a gradually sloping surface from the deck in to the water’s depths, similar to a natural beach. Another name for this type is zero-entry. Made from a variety of materials with different finishes, colors, and textures, this style is often made to closely resemble real sand. Water Features – Water features such as small waterfalls, water walls, fountains, deck jets and bubblers can be incorporated into the pool itself or the pools surrounds. These little touches can be elegant or exotic and lend an air of romance and fun. Visit this page for pictures of swimming pool water feature designs. Infinity pools are best used when they overlook spectacular scenery, in this case the houses lake view. The otherwise simple lines of the rectangular pool and surrounding deck emphasize the areas tranquil natural beauty. Big picture windows in the adjoining room allow you to enjoy the full view regardless of the weather outside. 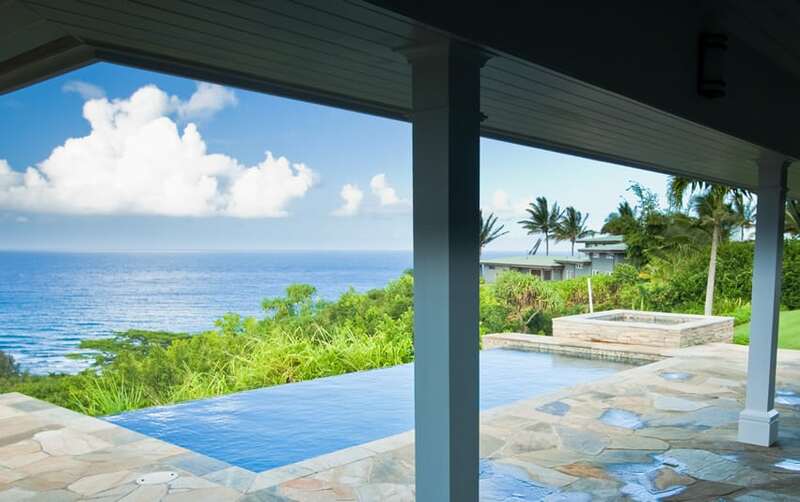 The flooded edge of this infinity pool vanishes into the horizon of an ocean front view. The darker blue hue of the floor tile provides a direct contrast to that of the sea and sky. Clean white decking and an inviting swimming pool cabana provide a chill and relaxing place to enjoy the sun, sea and sky. Playful water jets spring from the decking of this rectangular pool. Floodlights in the water play off the spray of the jets and the pools surface. This pool features a connected spa, an elevated hot tub decorated in tile and a wide deck for a place to rest and relax. 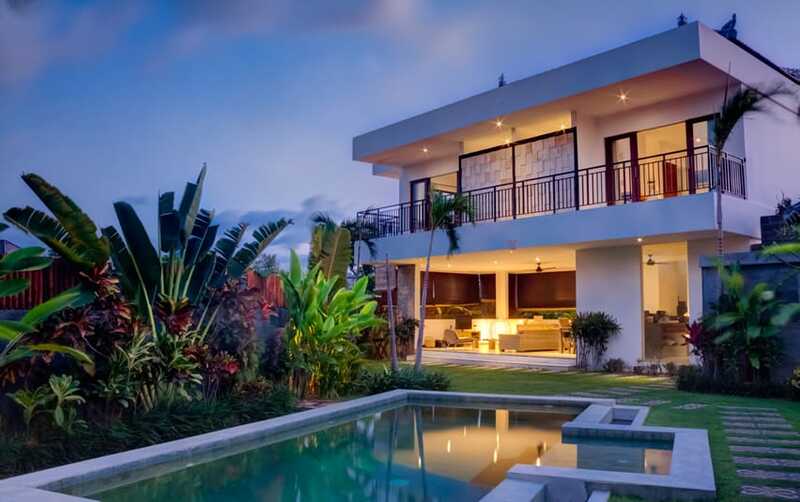 This two story modern home has a two-depth pool set in the midst of a tropical style garden. The lush plant life provides not just a nice view but also a serene screen that makes this pool a cozy place to relax. The bright lights of the nearby patio reflect nicely on the pools reflective surface. 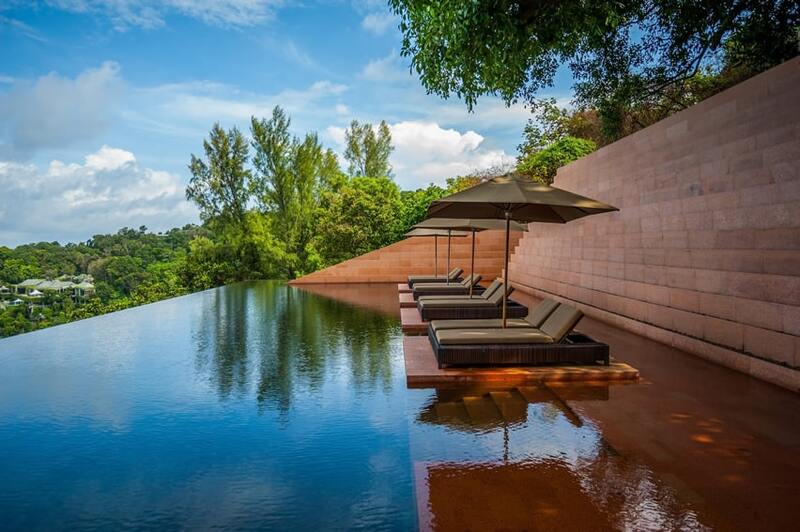 At one edge of this infinity pool, the water flowing over the wall blends the line of pool and view. On the other edge, sun shelves with individual resort-style lounge chairs provide a great poolside area to relax and enjoy the view and the play of the water and the horizon. Pictures of swimming pools with infinity edge designs are often favorites because of the dramatic effect they have on the surrounding landscape. 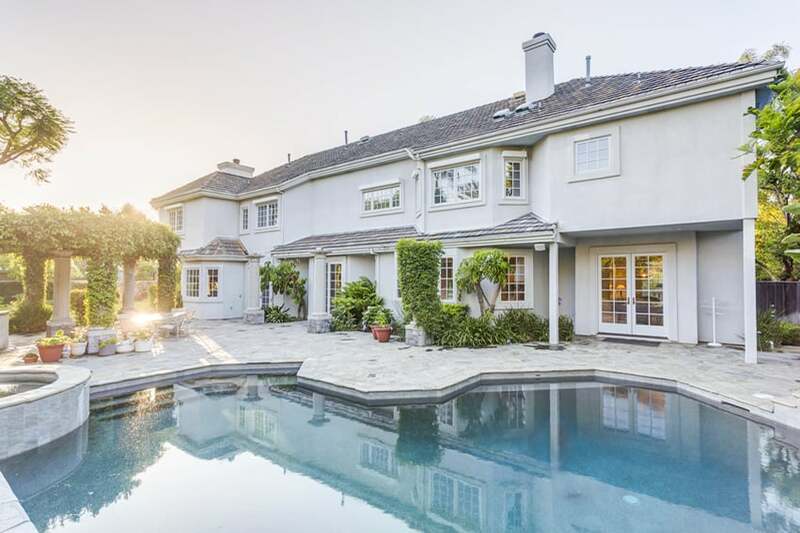 The irregularly shaped pool of this house takes great advantage of the space afforded of it in the sprawling backyard. The clear reflective water charmingly reflects back on the house. The brick trim of this pools coping with potted plants at the corners reflect the classical elegance of the home. 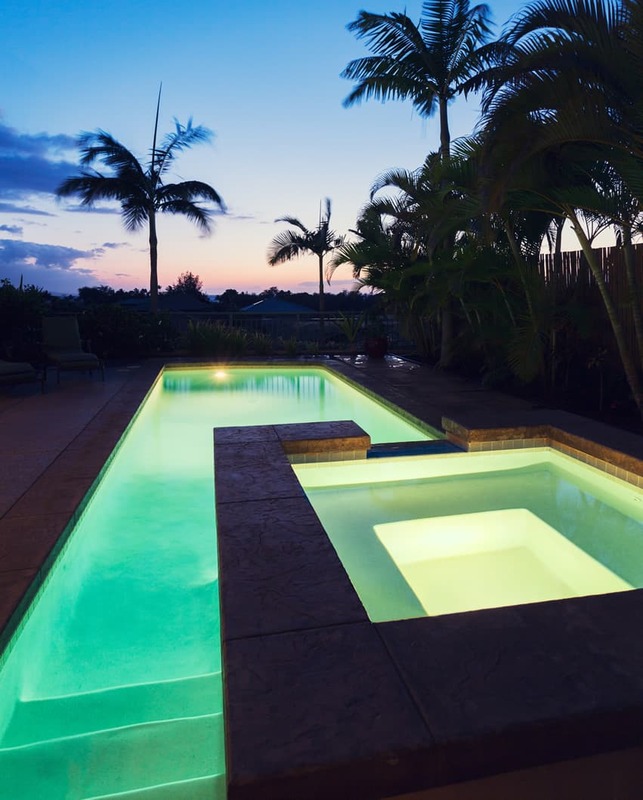 The simple and clean design of this perimeter overflow pool makes this a calm and spacious place to relax. A stone patio complements tanning ledge the wooden wrap around deck and provides a place for those who want to enjoy both the sun and the water. The blue depths of the sunken pool in this hilltop home lend you the calm feeling of being above it all. The infinite edge of this pool blurs the line between the pool and the horizon lending an illusion of space. The weathered wood deck provides a place to bask in the sun and enjoy the view. The simple curved edges of this back yard pool soften the harsh angles of the mirrored facade of this modern home. 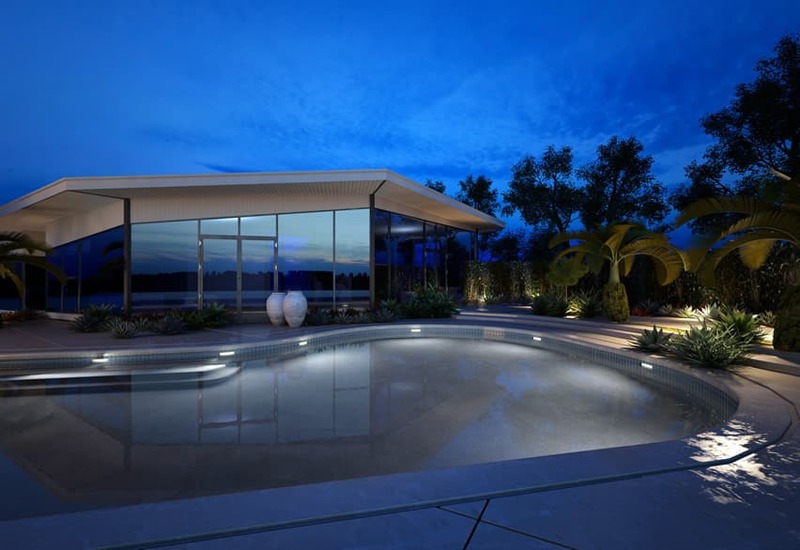 The pool provides a focal point for this backyard, with its calm waters and strategically placed pin-point lights. Fringed palms provide a discreet screen to enhance the feeling of the pool being a private world. 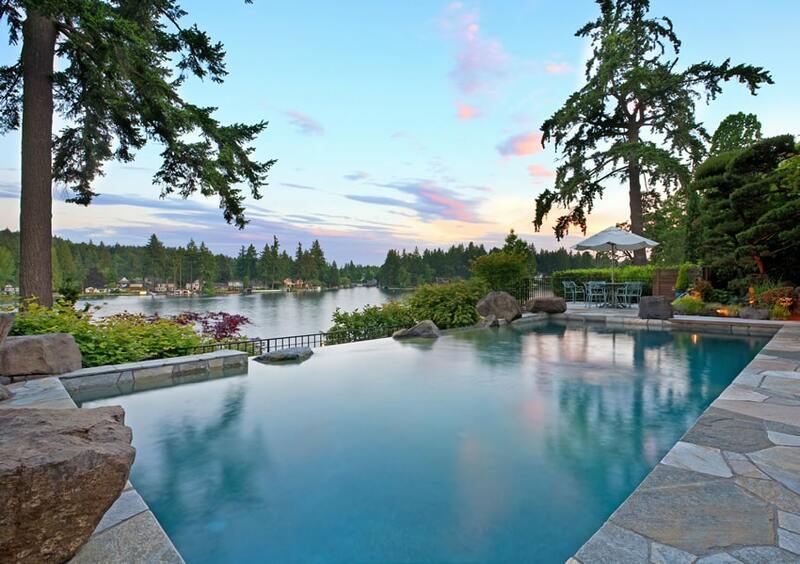 Overlooking the lake, this sunken edge infinity pool takes on a “rocky” theme and look. Rock formations provide an interesting pattern on the pools edge that help it blend in better with it’s natural surroundings. The rocky surface of the surrounding deck sport a nicely textured patter that sets this pool apart. 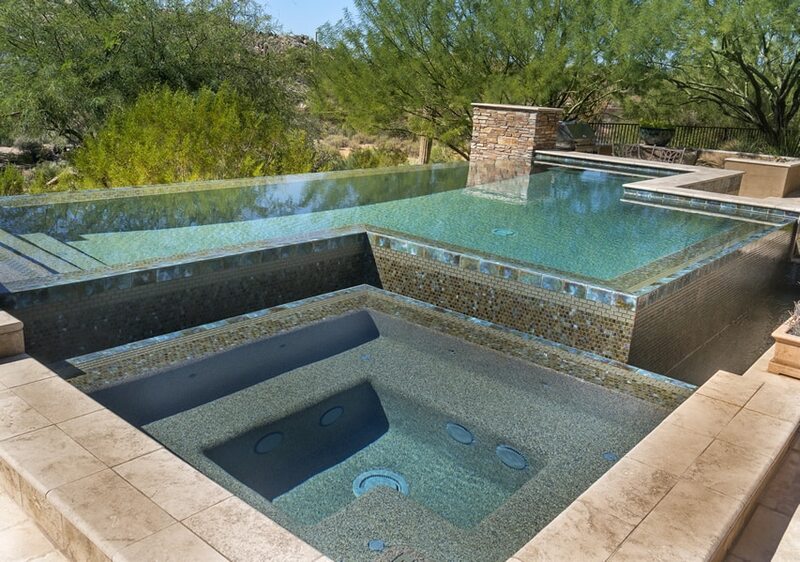 Multiple water features set this multi-level infinite edge pool apart. Whimsical pool waterfalls at the corners provide an interesting display and the sunken seating area at the pools far edge allow swimmers to relax and take in the view comfortably without having to leave the water. 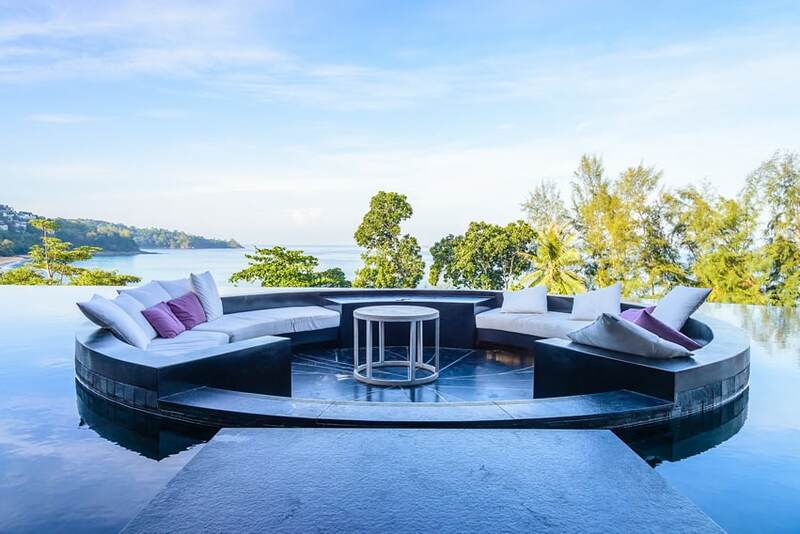 This multiple level pool’s rounded edges suit the soft blue of its waters. The shallow end provides a place to relax while the deeper end provides a space for play or exercise. The nearby gazebo provides a place to entertain and enjoy the water without actually getting in the water. The clean white and grey of this pools coping matches the overall color scheme of this house nicely. The entire area has a clean and airy feel. The irregularly shaped main pool has a dark bottom which contrasts nicely with its surroundings. A built-in stone hot tub provides a place to relax. A built in spa can provide you with a place to enjoy the calming and therapeutic benefits of warm flowing water. A sunken bar area provides a place for your guests to sit and talk while sun shelves allow them to relax and work on their tans. 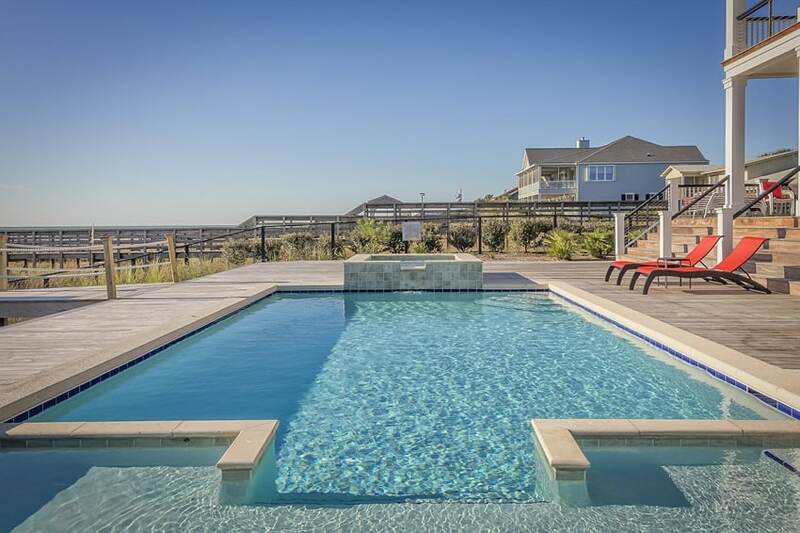 One of the best features of an infinite edge pool is the view. 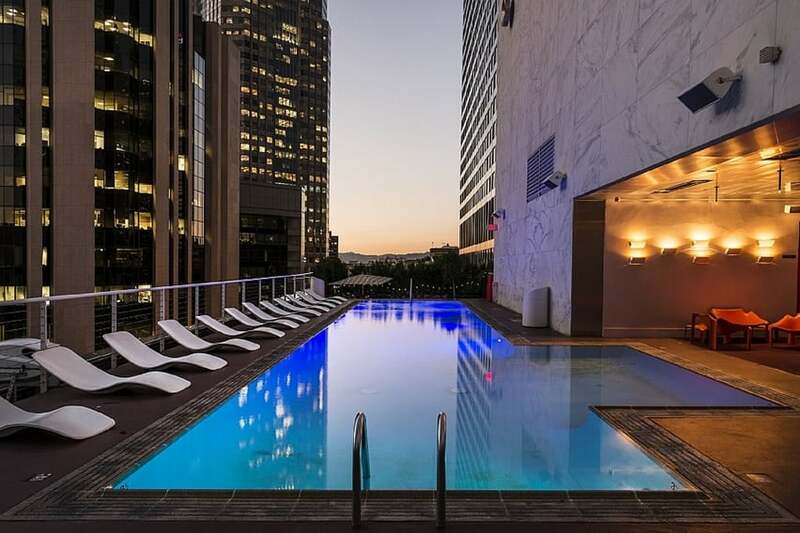 One of the best features of this particular infinite edge pool is the space it provides for people to enjoy the view with an upscale atmosphere. A circular lounge seating area in the middle of this pool provides a cool place to sit and have conversations in a unique location. What might otherwise have been simply a straightforward lap pool design is elevated with this pools incorporation of an elegant fountain in the middle and sunken seating areas at either end. The fountain adds an interesting focal point while the seating areas are perfect for relaxing either in-between laps or afterwards. This lap pool features a connected elevated spa area which doubles as a water feature. After swimming a few laps in the main pool level, enjoy the therapeutic benefits of a good soak in the warm spa. The underwater lighting allows you to continue to sink into the water as the sun goes down. 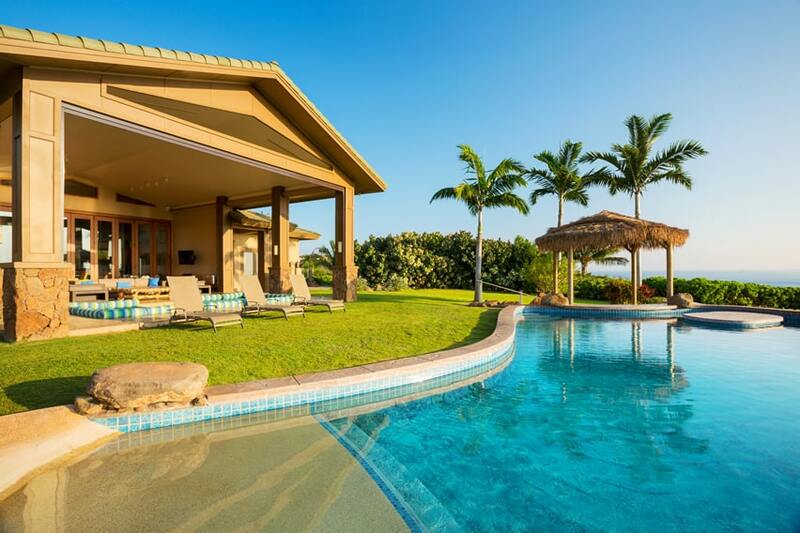 This pool and backyard is perfect for those who wish they were at the beach. A pebble textured beach entry evokes the feeling of stepping onto the sand and into the blue water of a natural beech. A gazebo surrounded by palms further enhances the at the beach atmosphere. 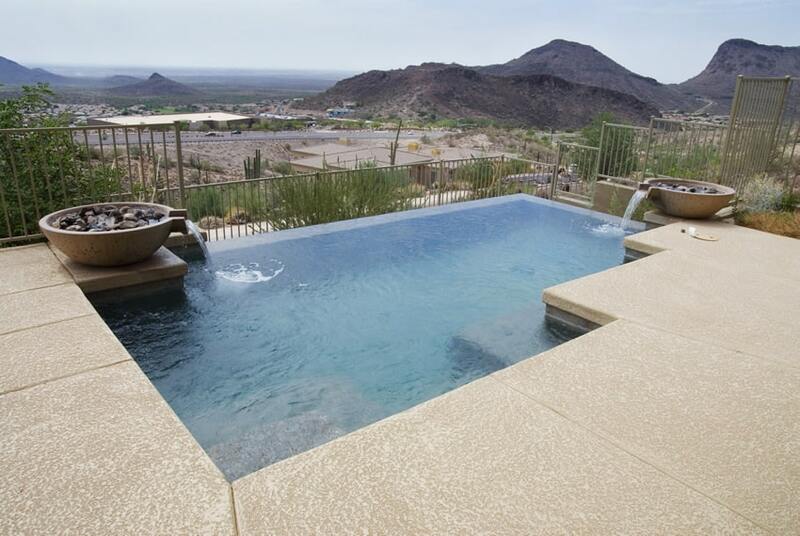 The gentle curves of this pool evoke the rough feeling of the desert scrub around it. The sandy stone coping around the pool and of the deck match the overall colors scheme of this home. A slate hot tub provides a place to relax and soak. 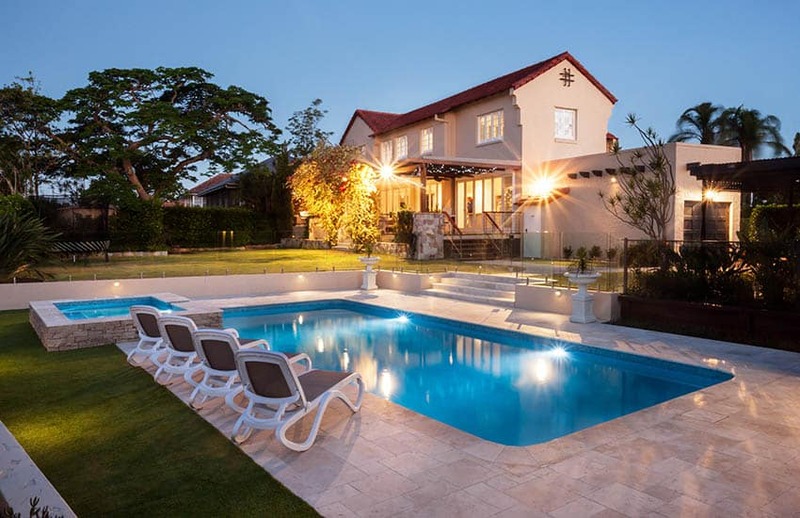 This two depth pool features a shallow area on one end, where people can splash and lounge about and a rectangular lap pool that takes up the rest of the pool area. After swimming a few laps, the pool’s users are invited to relax a bit in it’s elevated hot tub. The bright turquoise water and marble coping of this pool reflect the bright sun and sky for the feeling of being in an exclusive resort. Being surrounded by palm trees reaching for the sky and being able to sit on funky bright pink lounge style seating areas help enhance the feel of being in the perfect vacation spot. The simple and clean lines of this rectangular pool provide a harmonious space to enjoy the mountain view. A deck of untreated wood along half of the pool provides a nice perch where one can enjoy the cooling breeze and take in the unobstructed view of the area. This custom kidney shaped swimming pool features a water feature fountain with a shallow entry design. This shape pool is ideal for those looking to recreate a natural lagoon environment in their backyard. 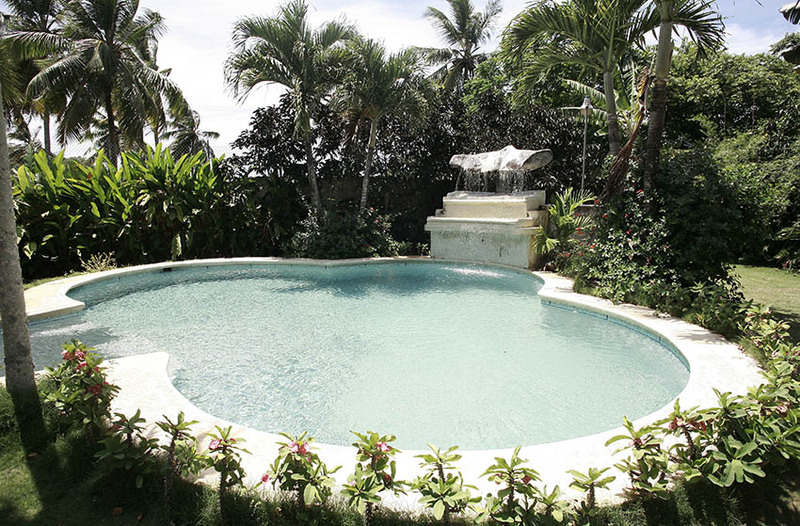 The pool’s lush tropical plants and landscaping create a relaxing retreat area that is sure to impress. 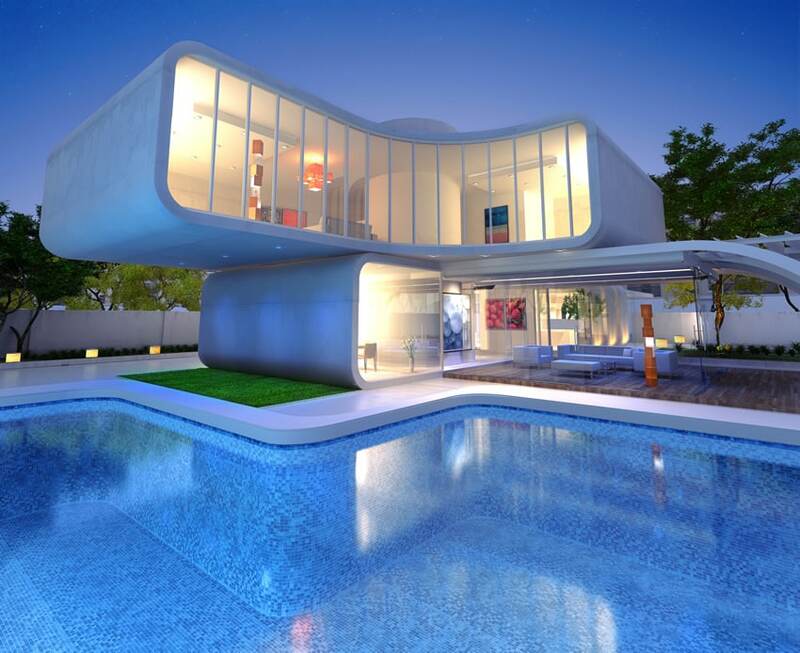 The curved and blunted lines of this pool evoke the same space-age cubic design of this house. Patterned mosaic tiles in different shades of blue live-up this pool’s bottom creating a nice contrast from the monochromatic white of the pool’s copings and the wooden decks furnishing. By playing around with colors and shapes of mosaic pool tiles they can be incorporated in the design of your pool’s floor, walls or sides. Another great place to play with colors and textures would be in your pool’s coping, the edge or cap around the outside of the pool. 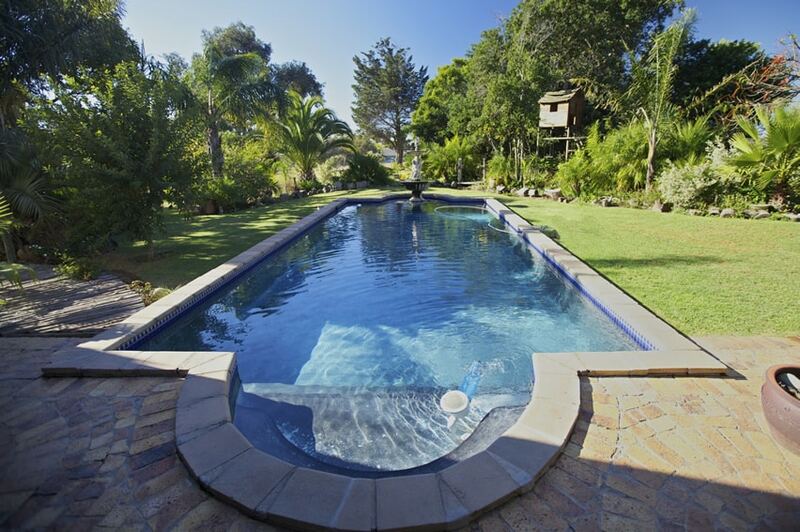 A variety of different materials can be used to suit your needs and your pools overall look. A pebbled or rough textured surface on the pool’s surrounding areas can also help enhance, not just the look of your pool but add a bit of extra safety as they will be less slippery when wet. Wood is also a good choice, especially for pool decks and gazebo floors, just make sure they’re weather treated and can withstand exposure to water. Another of our zen-like pictures of swimming pools. This modern swimming pool with white pillars supporting decorative steel canopies provides a peaceful and whimsical space to enjoy the crystal blue water. Overlooking the ocean, this pool is a chill spot to enjoy the breeze and the sights and sounds of the ocean spray without getting in the ocean itself. 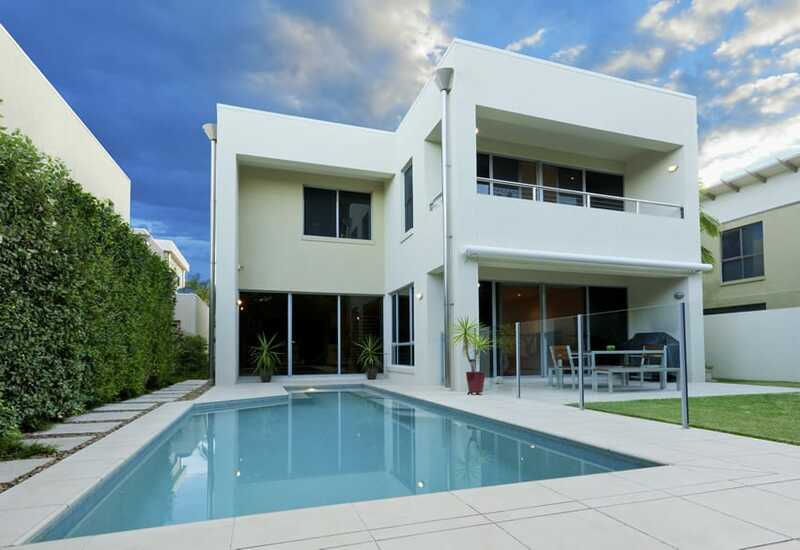 This simple rectangular pool with white tile coping matches the sleek and simple lines of this two story modern house. With its clean and crisp lines, the pool is the focal point of this back yard, reflecting the lines of the house back on itself. 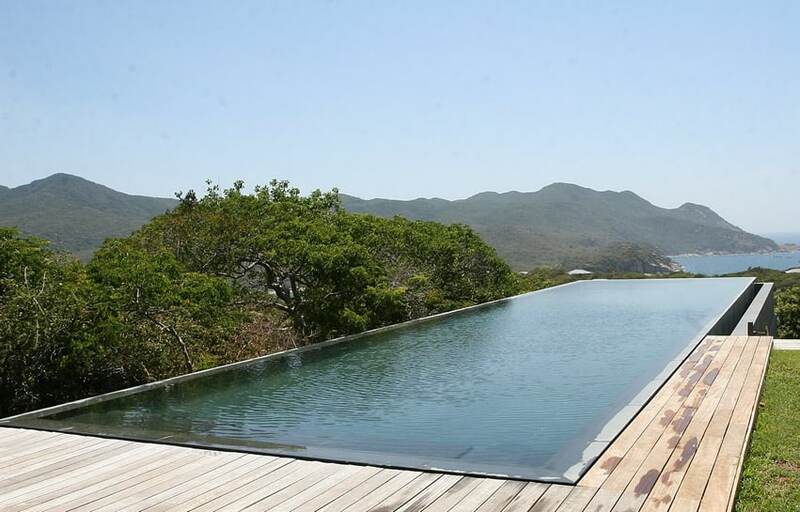 This simple and airy hilltop infinity pool provides swimmers with a cool and calm spot to just sit and enjoy the breeze. Overlooking the river, the pool’s edge blends in almost seamlessly with the horizon. As you sit here looking over the treetops you really are “above it all”. Several stories about the city street the calm blue water of this rectangular pool capture and reflect the cityscape. Modern design sensibilities reflected in the sharp corners of the pools coping and the sleek curves of the asymmetrical lounge chairs enhance the contemporary feel of this pool. This indoor pool evokes the feel of a Turkish bath with its granite coping, potted palms, simple tile patterns and wooden deck. A water wall fills the air with the soft noise of flowing water while old-fashioned wall sconces provide light. Sunken seating areas provide comfortable in-water perches. A fanciful checkered bottom of this pool is made up in tiles of various shades and hues of blue. All the blue livens up this rectangular shaped pool and adds to the cool and inviting feel of the area. A resort style sun shelf complete with lounge chairs and sun shades provide the perfect place to work on your tan. 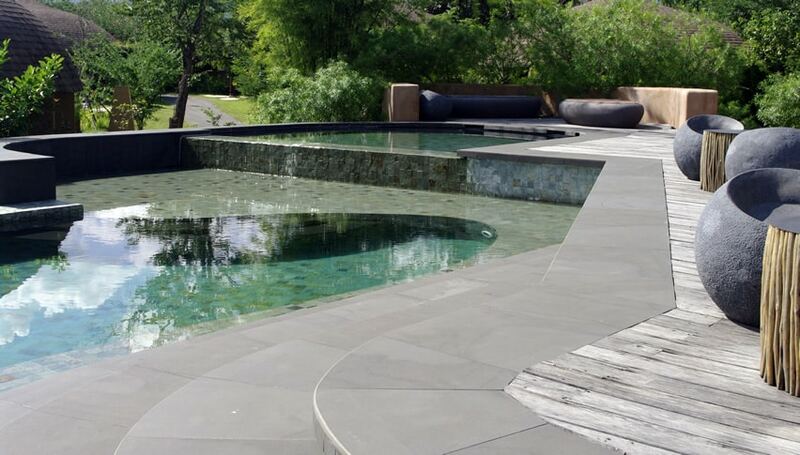 This multi-depth pool makes great and imaginative use of the rough texture and interesting colors of slate, stone and granite in it surroundings. The irregularly colored tiles of the pool’s bottom floor and sides lend to the overall feeling of depth and space. This multi-depth swimming pool has a pebbled finish and tile trim which lend texture, depth and substance to the area. A built in spa within the pool itself provides a comfortable place to relax and soak while the rectangular higher level ensures you have enough space to swim and play. A multi-level pool is a great way to have a pool that suits the needs of all. Multi-level pools can incorporate areas of different depths such as splash pools to accommodate users who want to relax, or lap areas where serious swimmers can perfect their stroke. 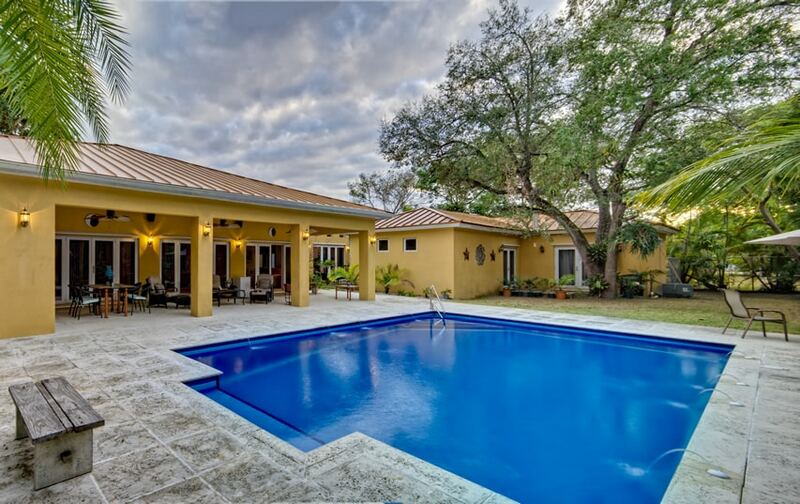 The pool finishes, such as the liners, plaster and tiles that make up the pools walls, surroundings and ledges can come in a variety of colors, designs and textures that can contribute to the theme and the landscaping of your yard. This swimming pool showcases a beautiful rectangular design with and elevated hot tub and a travertine patio. Travertine is a great material for a pool deck for several reasons. One of the best reasons why is that travertine is a natural insulator and reflects the suns rays which help to keep the feet cool. Unlike concrete or brick pavers, traverine stays cooler during hot days. Additionally, since the natural stone is porous it is more slip proof than many other common pool surfaces making it ideal for families with children or teenagers who like to run. Finally, a travertine pool patio looks beautiful and provides a nice contrast to the popular blue tiles used in pool design. 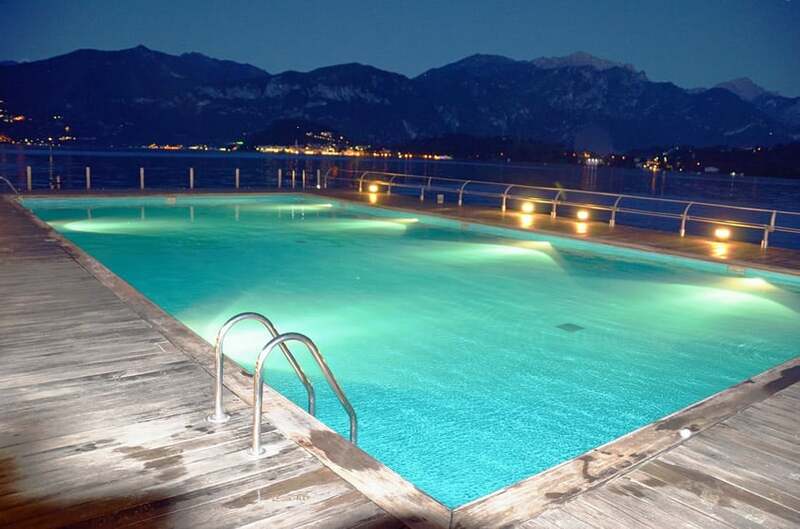 The dark blue waters of this rectangular pool are broken up by water jets placed along the pools sides. These water features’ draw the eye and provide a relaxing “break” in the pools surface and fill the air with the discreet melody of falling water. . 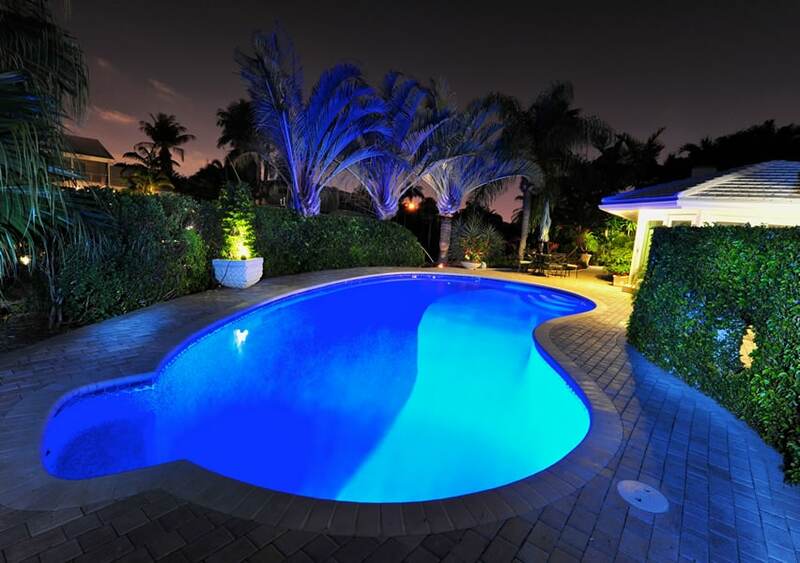 Wide granite tiles enhance the blue hue of the pool water. The aqua blue of this infinity pool reflects the infinite blue of the ocean it overlooks. The irregular stone patter of the pools coping contrasts nicely with its surroundings. A nearby hot tub provides yet another place to relax and enjoy the water and the view. This lagoon swimming pool features a variety of interesting water features to ensure hours of fun and relaxation for those in and around it. Rough stone in interesting patterns makes up the deck and lounge area. The rocky sides of the hot tub evoke the feel of a natural hot spring. A canopy covered patio with a dining area provides the perfect place to entertain in this poolside. 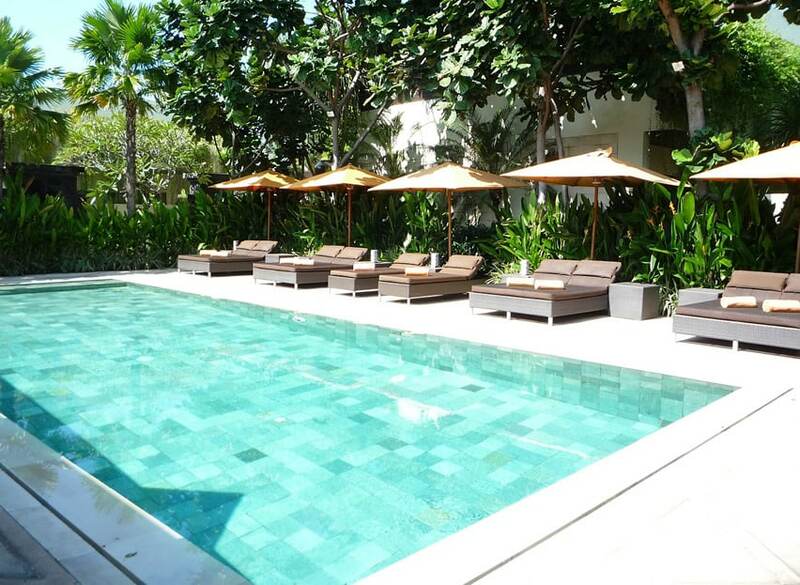 The rectangular swimming pool is just the right size to either swim a few laps or just soak and enjoy. 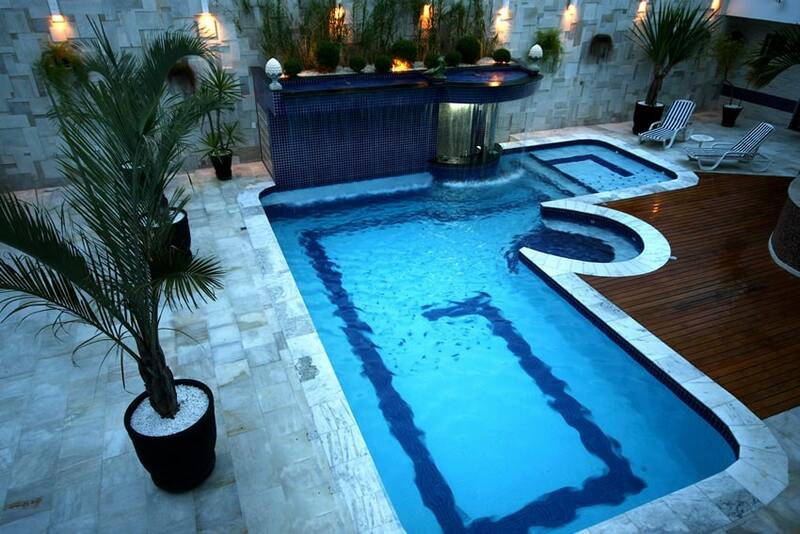 This pool keeps things lively with a water wall and fountain on one end. 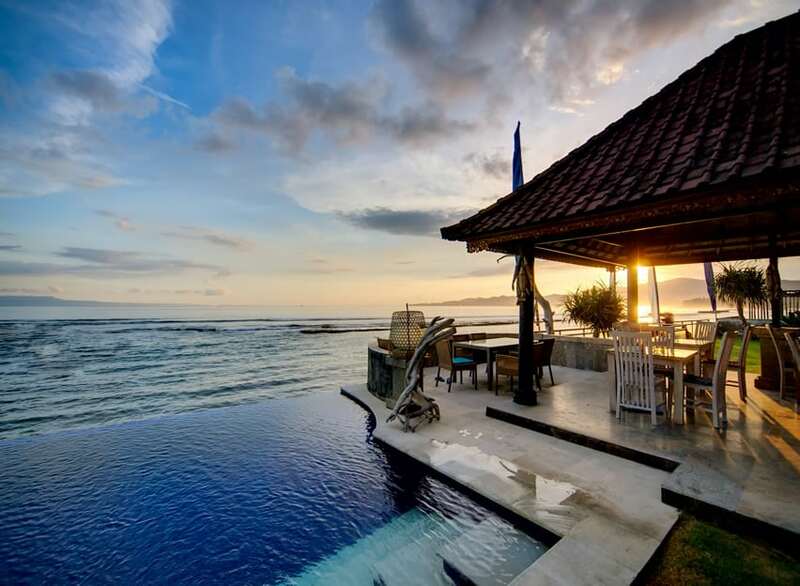 Pictures of swimming pools with beautiful ocean views are inspirational and some of our favorites. 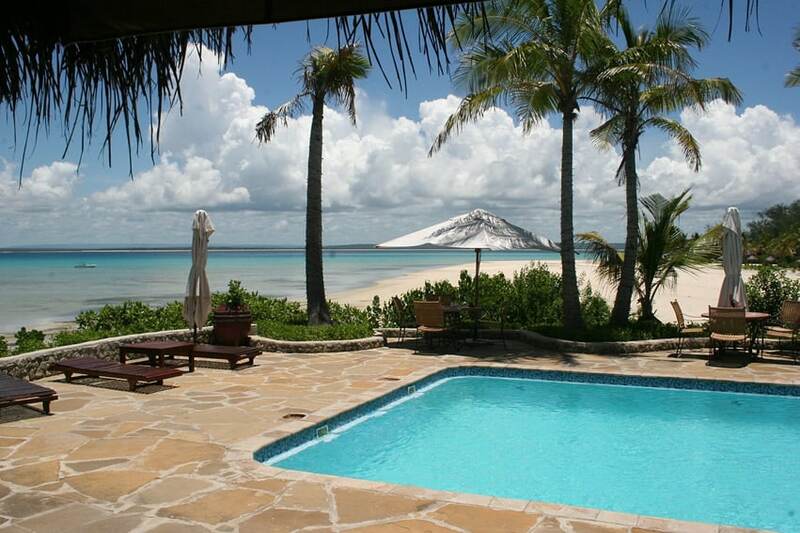 The sandy stone patter of this beach-front pool’s coping blend harmoniously with the surrounding sand. The blue tiles at the bottom of the tropical ocean front swimming pool reflect the blue of the waves crashing in the distance. Palm trees and other beach dwelling plants enhance the feeling of the pool being a part of the beach. 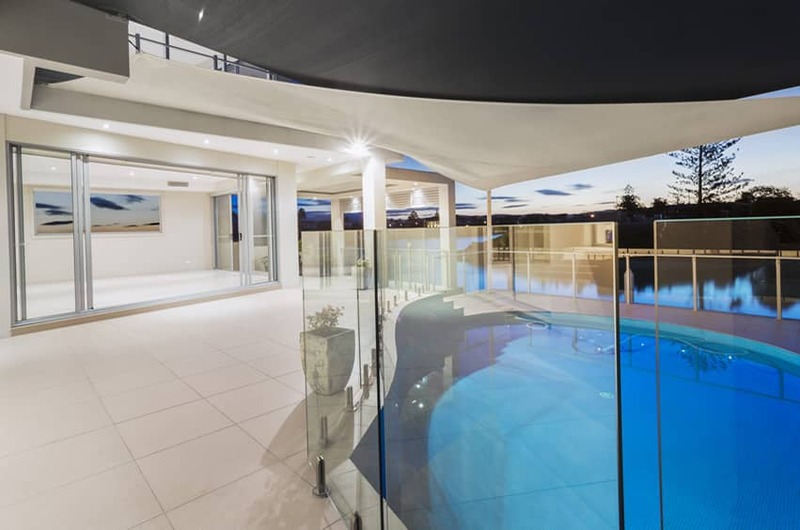 This glass enclosed swimming pool overlooking a river makes great use of the reflective power of modern stylish white to enhance the atmosphere of airiness and spaciousness. The deep blue of the pool is enhanced by the blue of the river for a cool and calming feel. A swimming pool fence is a must for families with children and can still look stylish with the right design.